and New Liskeard, beginning Monday. Nov 30 Gallery update. New pics from James Lalande, AJM Landry, Gene Albert, David Westaway, and Arnold McKale. Jul 7 The federal government in June again contributed $2.5M to ensure passenger service on Ontario Northland between Toronto and North Bay for another year. This has been a yearly routine since 1996. "This funding will ensure the continuation of passenger rail service while ONTC explores various options for this service as part of its Service Improvement Strategy," said Transport Minister David Collenette. Mar 8 CN officially submits bid for ONR. No details available, as details of all bids are confidential. Dec 16 Gallery Update. Check out the Santa Claus express shot! Nov 13 New gallery additions. Nov 6 Internal Solution Group formally submitted its business plan to ONTC Commission Chair Royal Poulin. Nov 4 New interactive map added, which includes subdivision details (only Temagami sub added so far). Also new additions to gallery. Oct 21 Gallery Overhaul: now divided into sections. Apr 1 Gallery update! Thanks to Jim McInnes, A.J.M Landry, and Karel de Rooij. Mar 12 Gallery update! First of a series from the Karel de Rooij collection. Thanks to David Shortt, Mike Robin, and Karel de Rooij. Feb 24 Big Gallery update! Thanks to Frank Vollhardt, James Lalande, Ryan Schoenfeldt,Bill Vezina and A.J.M Landry. Feb 22 Sighting: SD40-2 1734 as part of an eastbound CN consist, Pickering. Feb 21 Wondering if you're at the right place? Yep, this is the new design. Feedback is welcome. Feb 21 Added Developing the North to the links section. Jan 2 Check out this months trainscan news for an Ontario Northland feature. Dec 11 Sighting: SD40-2 #1734, Pickering. 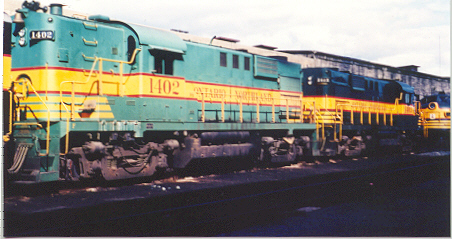 Second unit in a CN westbound. Dec 10 Moved old news to the News Archive page. Dec 4 Employee newsletter explaining today's announcement. Thanks to James Lalande. Dec 3 Some new shots added to the gallery 1805, 205, and some old baby blue painted boxcars. Dec 2 Santa Train, Cochrane edition. Departed at 9:30 am with units 1805, 210, 1800, 202 and approx 10 coaches. Nov 25 Santa train, North Bay edition. Departed at 10:00am with 2104, 202, 1800, 210 and approx 10 coaches. Nov 19 Wow! Another gallery update. Nov 14 You wanted them, you got them! Check out some newly posted steam shots in the gallery!Thanks to Frank Vallhardt. Nov 13 Another gallery update. Look for new shots from A.J.M. Landry and the webmaster himself. Nov 5 Gallery update - some new boxcar shots! Thanks to James Lalande. Oct 29 Word on the street is there will be a big announcement in the coming weeks.......Maybe the fate of the Northlander? Stay tuned. Oct 29 Added Mile262 and Sylvan Scale Models to links page. Oct 28 T&NO #503 moved from Lee Park in North Bay. Thanks to James Lalande. Oct 27 If you are visiting the Toronto Christmas Train Show this weekend, be sure to drop by the ONRH&TS (Ontario Northland Railway Historical & Technical Society) booth. Oct 17 Gallery update "That time is coming to dust off those snowplows....." Thanks to James Lalande. Oct 15 Redesigned Links page. Added new map. Oct 2 Gallery update! New rolling stock photos courtesy of James Lalande. Sep 11 Gallery update! A rusty 1600 and Caboose 126 to round out the collection. July 16 "The onr line was reopened last night sat jul15th just shortly after 11:00pm EDT. Todays northbound#111 went up around 10:45pm with the following consist onr sd57i #2104/2101/2103/gp38-2#1809/sd75i #2102 and 72 cars. It went through the washout area nice a slow, so it was great for photos. "Thanks to James Lalande. July 14 Washout caused by beaver dam break at mile 12.6 . Line closed until Sunday, July 16. July 8 Gallery pics. Thanks to James Lalande. June 19 Sighting: SD40-2 1734 as part of a northbound CN consist at Gravenhurst. May 31 Gallery pics. Thanks to Frank Vollhardt. May 13 Gallery pics. Thanks to Pat & David Othen. Check out the Abitibi S4 shot. May 12 Some ISP problems over the last week. New updates this weekend. Apr 21 Northlander resumed service from North Bay to Cochrane Thursday evening. Apr 13 Worried union leaders fear track conditions on the Ontario Northland Railway compromise rail safety and place operating personnel at risk. Apr 1 BREAKING NEWS!!! Ontario Government to sell Ontario Northland Railway division!!! Northlander should resume service by the middle or end of the week. Mar 20 Sighting: FP7A 2001 with EGU 204 @ Union Station Toronto. Getting set to head north after the turn at Mimico. New ONR discussion group hosted on egroups. Click here. Mar 14 Acid from freight cars leaking into creek "TEMAGAMI, Ont. (CP) - A highly-corrosive chemical leaked from two of at least 19 rail cars that derailed into a creek Tuesday evening just south of this northern Ontario community. Fifty of the 51 Ontario Northland Railway tanker cars were carrying undiluted sulphuric acid when the train went off the tracks in a remote area about six kilometres south of Temagami, police said. Neither the train's engineer, Glen Hay, nor the conductor, Brian Hager, was injured in the accident that police say happened when a bridge over the creek gave out. Officials could not immediately say whether the leaking chemicals posed any danger to the area's environment, which includes protected wilderness, or residents of the nearby town. The acid is highly corrosive and its fumes can be harmful to breathe. The site of the derailment, about two kilometres from the highway, is accessible only by train, said Sgt. Dan Owca, with the North Bay provincial police detachment. Owca said the track, which runs north through Cochrane to Moosonee, is likely to be closed for at least a week. Temagami is 130 kilometres north of North Bay." Feb 28 New photo: A jade green coloured 1402? Feb 20 Sighting: "ON #1731 is today at Columbus, Nebraska, USA, on the Union Pacific Railroad. I would guess that it has been leased by the Union Pacific for a term as it looks to be assigned to local service (along with CP #5789)." Thanks to Bill. Feb 20 Check out the 1967 timetable! gallery. Feb 19 Various site format changes. New photos in gallery. Feb 6 New links and photos. Feb 1 18 images! Check out the gallery. Jan 22 Site relocated. Hopefully speed will be faster now. Dec " TORONTO (CP) -- The union representing railway workers at Ontario Northland has set a Saturday strike deadline. The Associated Railway Unions announced Thursday their members would walk out at one minute past midnight tonight. "Friday's Northlander train is going to be cancelled but it is going to be replaced by buses so that people who are looking to travel will still be able to get to their destinations," said Judy Cardoni, Ontario Northland spokeswoman. The Northlander provides service between Cochrane, Ont., and Toronto. There is connecting shuttle bus service to the northern Ontario communities of Timmins, Iroquois Falls, Smooth Rock Falls, Kapuskasing, and Hearst. In the event of a strike, modified Little Bear service will be maintained on the mixed freight-passenger train between Cochrane and Moosonee, Cardoni said. Negotiations were to continue today but neither Ontario Northland nor the union would say what issues were standing the way of an agreement." Oct 17 Sighting: "....1731 with 1733 sandwiched between CN 5513+5643 and CN 4101 turning westbound from the southbound CN Bala Sub onto the westbound CN York Sub towards MacMillan Yard. They were in terrible paint condition..." Thanks to Christian B.
Sept Roster information added. Do you have anything extra to add? Aug First SD75I pic now available! Aug Ontario Northland track maintenance employees rejected a deal that included a shortened work week or pay cut. Aug Ontario Northland clerical workers ratified an agreement that included a shortened work week. Aug Ontario Northland mechanical workers are on strike. SD75Is 2100,2101,2102,2103,2104 delivered from Alstom! All contents and photos ©1999 by Neil Stabler except where noted.